Payments make the web go ’round. If you want to sell things on the Internet, automate the processes, and control the experience, you need to use a payment API. Typically, a payments API is most useful when you want flexibility in charging customers without the commitment and setup required with a traditional merchant account. Among the common use cases developers need to handle are one-time purchases, subscription billing, recurring charges (including overages), and multi-party payments for marketplaces. Sell something: obviously the shortest distance between you and business success is collecting money from somebody. If your users will pull out a credit card to pay you, you need a way to accept that money. Subscriptions: what’s better than taking someone’s money once? Taking it every month, year, or any frequency you define. Mine payment data: even if you don’t need a Payment API to accept money, you may have a service that needs to tap into your customers’ payment data. Payments were one of the driving factors of the Internet in the 1990s, and PayPal was one of the earliest and easiest ways to accept month through the web. While Stripe may own much of the developer mindshare, PayPal’s own marketshare is undeniable. In terms of this comparison, PayPal also owns two thirds of the APIs represented, after acquiring Braintree in 2013. Stripe is the newest and smallest, but has incredible traction with developers. The others, especially Braintree, have made strides toward the developer experience of Stripe, but it still leads the way. 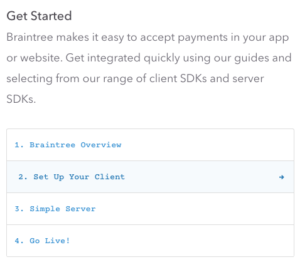 Four steps to getting started with Braintree at the top of the docs page. Time is money, right? If anybody understands this it would have to be Payment API providers. Stripe has made a name for itself with its excellent documentation that helps developers get started fast. That’s why it’s the one to beat in this section of the comparison, with nearly perfect marks in the DX Index. Despite Stripe inevitably leading the way, all three payment solutions shine in developer experience. Each is fully self service, with transparent pricing. Stripe and Braintree make getting started a quick process, with SDKs across all major programming languages. 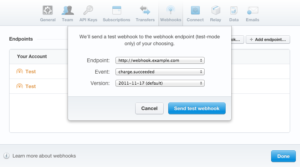 Stripe Webhook settings include sending test notifications. Real-time notifications, or Webhooks, are how payment processors pass important information to your applications. For example, you can receive a notification that a payment is approved, which allows you to automatically make a change to the customer’s account. From individual charges, to subscriptions, to disputes, and more, these webhooks are how you fully bake payments into your application. Braintree covers 19 event types, separated into categories for disbursement, dispute, partner merchant accounts, sub merchant accounts, subscriptions, and testing. PayPal has a different 19 event types, with invoicing, payment, and dispute categories. Stripe leads with 67 event types, with the following categories: accounts, application fees, balance, bitcoin, charge, coupon, customer, invoice, order, plan, product, recipient, sku, transfer, and ping. While more types is not necessarily better, it suggests either more features or more granular access to events.